Have you always wanted the perfect home away from home? Searching for travel trailers for sale that you can pull without having to invest in a truck? If so then you needed to head to your local Airstream dealer in Wisconsin and see one of the many new and used Airstream for sale. Here at Ewald’s Airstream of Wisconsin, we have everything from single axle Bambi trailers like the Airstream Basecamp to family-friendly Airstream trailers for sale like the Airstream Flying cloud and everything in between. Here at Ewald’s Airstream of Wisconsin, we understand that each person who walks through our doors are going to have different wants and needs. Which is why we have a team of people who are happy to answer any and all questions you may have about one of the many new and used Airstream trailers for sale in Franklin, WI. That includes questions about the Airstream Flying Cloud lineup. This Airstream travel trailer for sale is perfect for families big or small and with over 15 different layouts to choose from you can find the Airstream Flying Cloud that is perfect for you. These Airstream travel trailers are built to fit the needs of just about anyone is made to be moved from place to place with ease. The Airstream Flying Cloud is open and airy, so you will not feel cramped in this trailer. Light fabrics and wood tones create a spacious feeling, and panoramic windows let in plenty of sunshine. A galley style kitchen with plenty of counter space allows you to prepare and serve all of your favorite meals easily. Innovative storage features kept things clean and organized so you will not have to deal with clutter in your living area. Have the best night sleep on the custom pillow top mattress that curves to fit your Airstream trailer perfectly. Built in wardrobes let you hang and organize all of your clothes, so you do not have to deal with digging through suitcases when you travel. Never worry about your kids being bored on a rainy day ever again, with tech features that seamlessly blend in with the decor of the Airstream Flying Cloud. Some of the technology features included with the Airstream trailer for sale are a Samsung LED HD TVs with surround sound, Blu-Ray DVD player and USB and 110V outlets throughout. The Airstream Flying Cloud can sleep up to six people comfortably and with the option for two twin beds or a full bed in the private sleeping area there an opportunity that will fit almost everyone's needs. Airstream trailers are built to last, and with aerodynamic designs, even a novice driver will be able to tow this trailer with ease. When you are looking for an Airstream dealer in your area with many new and used Airstream travel trailers for sale come to Ewald’s Airstream of Wisconsin in Franklin, WI. 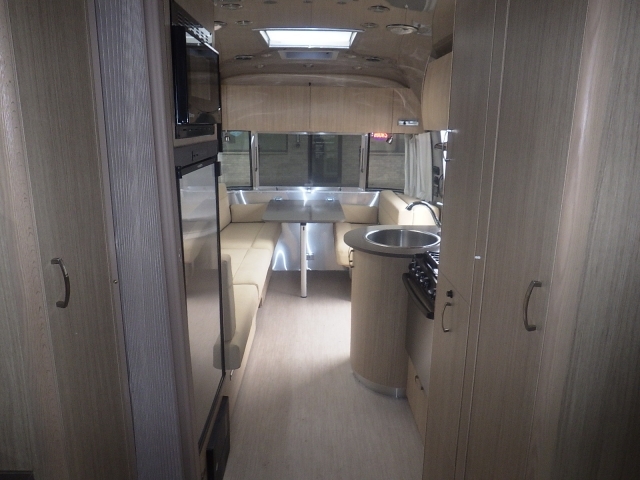 One of our salespeople will be happy to walk you through the Airstream Flying Cloud. 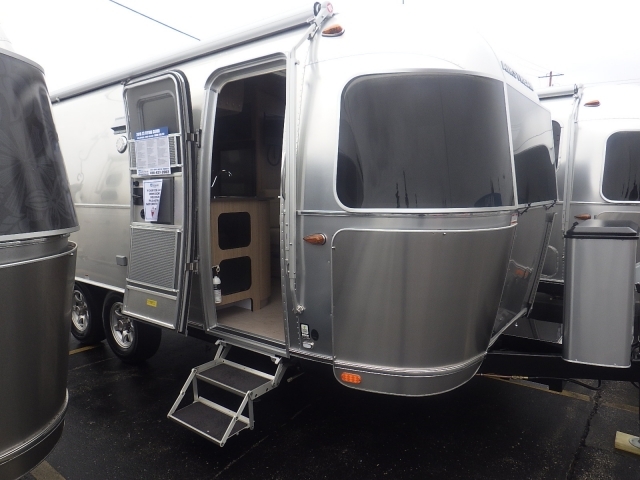 If this Airstream travel trailer is now what you are after come and see one of the many other new and used Airstream trailers for sale in Franklin, WI. When you are looking for an Airstream dealer near you, come to Ewald’s Airstream of Wisconsin at 6269 S 108th St, Franklin, WI 53132.